Frustration is growing as providers remain unable to access the apprenticeship vacancy matching service or post new adverts — three days after it should have reopened following maintenance. Provider access to the website which allows them to advertise apprentice job opportunities to potential learners was shut off as part of a planned closure on Thursday (July 23) to switch suppliers which was planned to end first thing on Tuesday morning. However, three days later, although members of the public can view and apply for jobs posted on the site, providers are unable access applicants’ details or post new vacancies — and the Skills Funding Agency (SFA) said it has no idea when the problem will be fixed. And dissatisfied providers also took to the SFA-run FE Connect help forum to complain. One user, Blackledgeds, said: “Do you have any idea when the apprenticeship vacancies website will be up and running? Another, user name chrislant1, said their company had 17 vacancies it needed to place on the site and “numerous” interviews to arrange using applicant details. The user said: “We have now not been able to contact any applicants for a week. 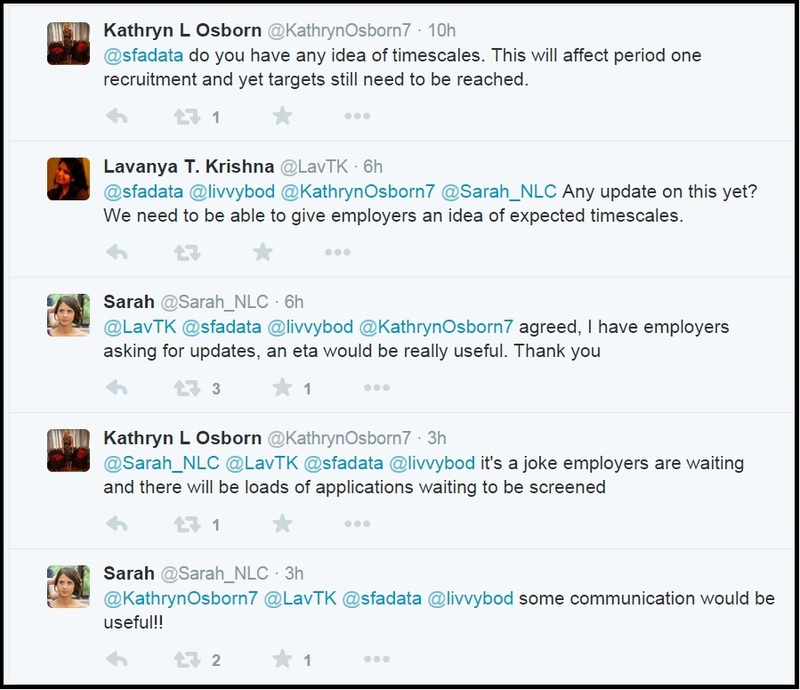 “This is not acceptable, we are unable to provide any guidance for applicants or information. The SFA’s representative on the forum said at 9.29 this morning that there was no “eta” — estimated time of arrival — for the service, but added the apprenticeship vacancies site was “the current priority”. So far he has yet to respond to a request for an update at 11.10am. An SFA spokesperson said: “Our priority is working on the apprenticeship vacancy website, the issue is that the find an apprenticeship website is up and running for the general public but providers are currently unable to publish new vacancies. The planned closure also include the SFA’s Hub service, the online data uploading system, which allows providers to submit their Individualised Learner Record data to the Skills Funding Agency (SFA) in order to process payment — that remained closed for an extra day after it was supposed to reopen, causing concern over whether providers would be able to meet the August 6 deadline for the twelfth monthly data return (RO12) for 2014/15. The data collections facility on the Hub has now been reopened, allowing provider to upload data, although the finance and contracts hub remains down. The apprenticeship vacancy service is now up and running — four days after it was due to reopen following maintenance work. An SFA representative posted also update on the FE Connect help forum at 8.24 this morning. The email account the SFA set up yesterday for concerned providers has received “a number of queries” the post said. Is it really such a big deal that a system is unavailable for 1-3 days? No more than 5 people have complained. Have you nothing relevant to report on? What is the quantifiable impact of this? Instead of reading a msg board do some proper journalism! I can only think that you have something to do with the company that has botched up the website or have no idea of the importance of providers being able to upload vacancies, particularly in the busiest period of the year. It is just one more example of the inefficiency that has been a hallmark of funders in the last few months. I hope the SFA ‘fine’ the company responsible and use that money to improve their services.